A storm blowing through the Mazatzal Mountains (in the background) causes rough waves to form in the Apache Lake waters in this February 16, 2015 photo. The Painted Cliffs rock formations are lit warmly by an afternoon sun making them shine with a vibrant gold hue. 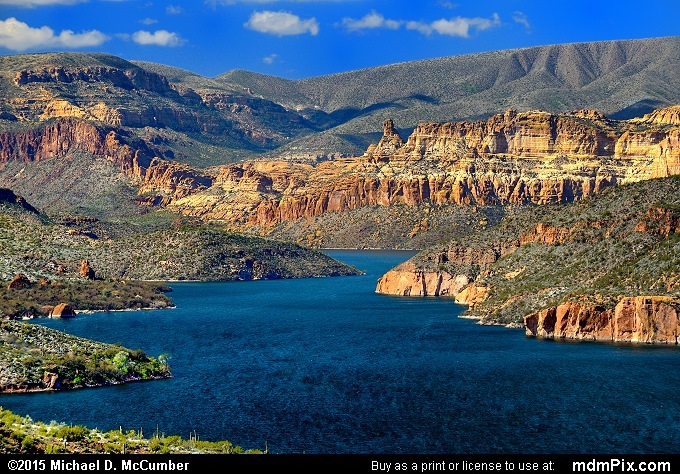 Apache Lake is the longest of the four reservoirs formed from the Salt River in central Arizona and is a popular destination within the Tonto National Forest. The gorgeous day featured clouds hovering over the highest elevations of the Mazatzal Mountains to the north and extreme but warm wind gusts near the lake itself.